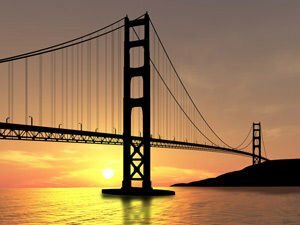 Golden Gate Bridge is an unprecedented for it’s time creation of engineering genius and not accidentally is considered one of the wonders of the world, as created by human hands. 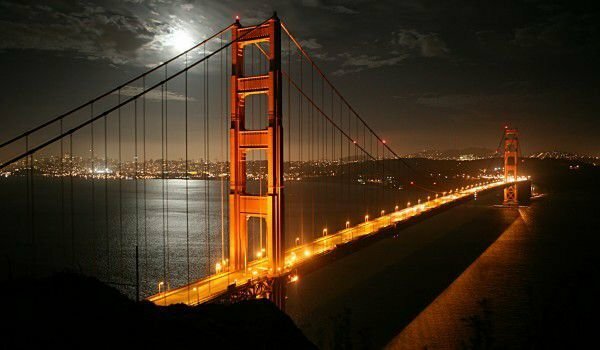 According to the publication Forbes Traveller, the Golden Gate Bridge really deserves first place among the world's most majestic bridges, as it surpasses masterpieces such as Tower Bridge and London Bridge in the English capital. Golden Gate Bridge or the Golden Gate translation is a suspension bridge that connects the northern peninsula of San Francisco (Marin County). The grand structure is built over the Strait of Golden Gate , which separates San Francisco Bay from the Pacific Ocean. 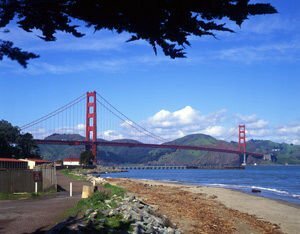 Immediately after the northern end of Golden Gate Bridge is located Sausalito, which is a popular tourist center and is part of the so-called “Golden Gate recreation area”. Before building the bridge the town was a very terminus of rail and ferry routes. Although the presence of the bridge is there, many people still prefer the ferry as a service. The very background of the construction of the facility was accompanied by much troubles. Containers on ships and ferries were totally against it, because the bridge would impede navigation. On the other hand, a guild gaining momentum, the industry of production of cars stood firmly behind the construction of the Golden Gate, because for them it meant more work, and more money accordingly. Before the bridge construction was to begin, the only route from San Francisco to Marin County was by boat through one point of the bay. People liked to build a bridge, which experts said was close to impossible because of the depth of 150 m in the middle of the strait and the strong winds. In 1916 a student published an article that presents a proposal to build a future Golden Gate. Based on urban design, the architect estimates that its construction would take about 100 million U.S. dollars. On June 28, 1921 a young engineer sent his project for a facility consisting of two solid brackets on both sides of the Strait associated with a central suspension segment, the cost of its construction amounts to 27 million U.S. dollars. With some changes and contingencies authorities’ approved option is a suspension bridge designed by Joseph Strauss. Construction begins on January 5, 1933 - more than ten years since the publication of the original plans for the bridge. Golden Gate Bridge was completed on May 27, 1937 with noisy celebrations that continued for one week. First day of putting into service on it go over 200 thousand pedestrians. Cars and trucks are placed on the next day. Now moving in one direction at Golden Gate costs about $ 5. After final completion of the Golden Gate Bridge became the bridge with the largest opening in the world - the whole of 1280 meters. It became second, after the construction of Verrazano-Narrows Bridge, in New York, in 1964 The supporting towers are with height over 746 feet and the entire bridge is a characteristic orange color. So ships passing through San Francisco, known as the misty city, find it easy to navigate the structure. Local architect Irving Morrow has made the overall design of the towers of the bridge, the lighting scheme and its decorative elements - street lamps, railings and walkways. The famous orange (International Orange) color is used as the primary corrosion protection of bridges. An interesting fact is that 10 weeks after placing the bridge in service, came the first suicide from it. From there onwards the tide of "willing" to jump from the bridge starts growing. Numbers are about 1218 deaths of Golden Gate Bridge “jumpers”. Speed limit on the bridge is 72 km / h, the facility has 2 towers higher than the Monument of Washington. According to some, the length of the cables of the Golden Gate Bridge can circumvent the earth's equator. The bridge is about 2 km long and the distance from the water beneath it to the highest point of a tower is 230 m.